One of the most effective ways to create a healthy energy efficient home is to incorporate passive solar design. A house designed in this way makes use of ﻿thermal mass﻿ (in the form of a concrete floor or masonry wall) to control indoor temperature, thus reducing or even eliminating the need for additional heating or cooling. This is a very exciting aspect of environmentally sustainable design and an area where a lot of energy savings can be made for very little extra cost at the construction stage. 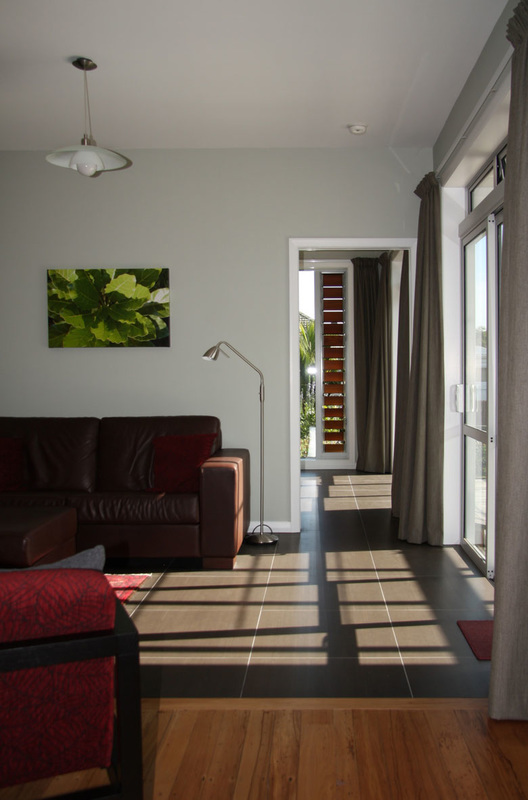 Windows and eaves are sized and orientated in such a way that during winter the sun enters well into the house, its warmth taken up by the thermal mass which is usually a concrete floor. 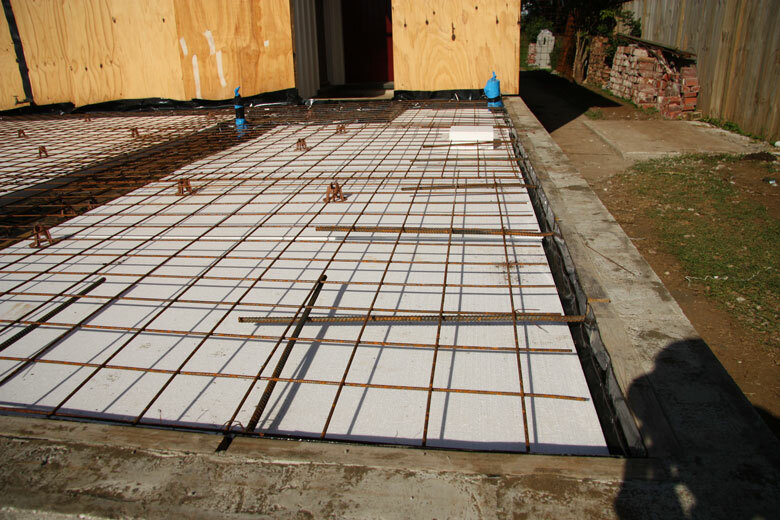 The floor slab is insulated underneath, generally with polystyrene, and should not be covered with low-density coverings such as carpet or wood in areas where the sun will strike it as these will prevent the heat from being absorbed. Polished concrete or floor tiles are common floor finishes. A thermal mass wall, usually concrete masonry, can be used instead of, or in addition to, a concrete floor. Because the sun’s path is completely different during summer (further south in the morning and afternoon and much higher at mid-day) it is possible to keep the sun out of the house during these months by making sure eaves are the correct size and large windows only face north; in addition, because it no longer receives direct sunlight at this time of the year, the thermal mass will actually keep the house cool. An additional advantage of passive solar design is that a house designed in this way can have small windows left open even during winter (because of the inherent warmth in the thermal mass) which helps keep the indoor air much dryer and in turn makes rooms feel warmer. 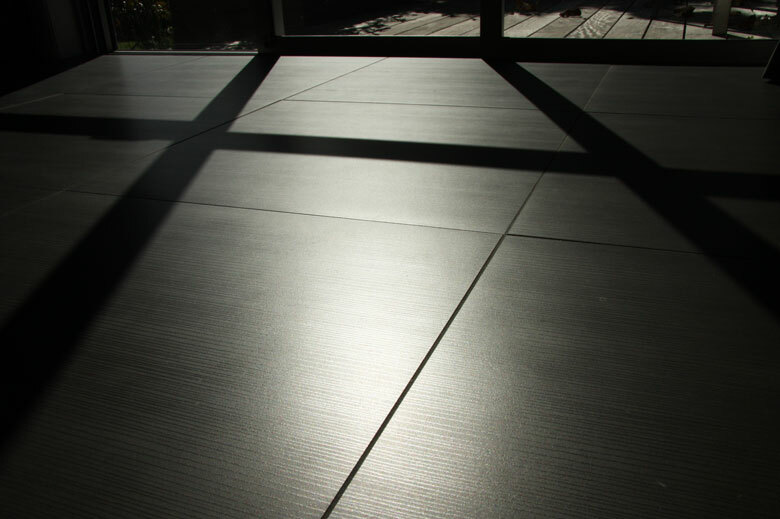 Exposed polished concrete or floor tiles draw the sun’s heat into the insulated concrete floor slab which in turn provides warmth during the evening.